Brittney Hackett is all smiles as she displays her award for Best Actress during the Southwest Little Theater Angel Awards ceremony on Saturday evening. Southwest Little Theatre (SLT) held its 15th annual Angel Awards on March 21. The event was hosted by Jessica Hartman, the current Miss Missouri. Students Chase Logan, Brittney Hackett, Blake Barnes and Michael Hornback acted as Masters of Ceremonies. The theme of this year’s Angel Awards was “Somewhere Over the Rainbow.” The students in Southwest’s Theatre Department presented monologues in which they spoke of their lives right now, their hopes for the future and finally, dedicated their year of hard work to those whom they felt had made a major impact on their lives. The students had spent four weeks writing and practicing their monologues under the tutelage of their instructor Wyatt Hester. Some of the monologues dealt with serious themes like loss of family members and friends, drug abuse and the impact of divorce on families. Kristen Hendrix, for example, spoke with emotion as she told the audience about losing her grandmother. Other performances were more lighthearted. Sydney Leroy began her monologue by singing a few lines from “Somewhere Over the Rainbow,” and Tanner Leonhardt included Spiderman in his dedication. 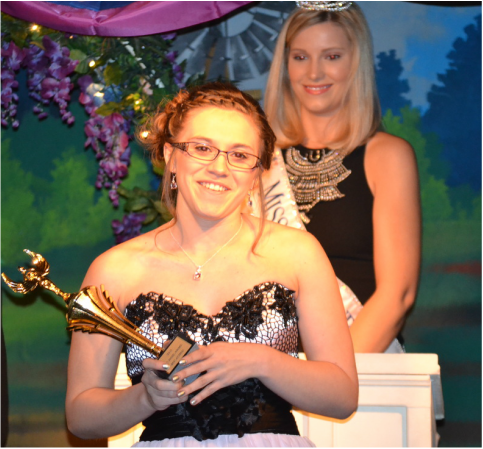 After all of the monologues had been delivered, Hartman performed her Miss Missouri talent by speaking about her work to break the stereotype that girls cannot be both beautiful and smart. After Hartman spoke, junior Alex Jimenez presented her with a bouquet of roses, dropped to one knee and asked her to be his date for prom. Hartman turned him down but did give Jimenez a kiss on the cheek. The event wrapped up with the seniors being recognized. After all of the seniors came on stage though, they also called Hester on stage to express their appreciation for him. SLT also gave out over $3,500 in scholarships to 11 students. They were: Brittney Hackett, Alex Jimenez, Kaitlyn Roberts, Chase Logan, Jessica Henderson, Kayna McNabb, Kallie Bowman, Alexis Kelley, James Sellars, Orion Lawyer and John Mulkey. Hester stated he is very proud of what his students have accomplished. “I continue to be moved by what our children have to say, I am delighted by their performances and am passionate about making sure we prepare them for the future. I see the SLT Angel Awards as a manifestation of these goals,” he said. • Best Actor: Chase Logan. • Best Actress: Brittney Hackett. • Best Supporting Actor: Orion Lawyer. • Best Supporting Actress: Sydney Leroy. • Best Cameo Actor: Blake Barnes. • Best Cameo Actress: Jymme Ash. • Technical Excellence: Baylea Ford. • Best Scene: “I Quit” Devon Decker and Rachel Jimenez. • Best Actor: Austin Moreton. • Best Actress: Rachel Jimenez. • Best Supporting Actor: Dakota Saunders. • Best Supporting Actress: Hope Robbins. 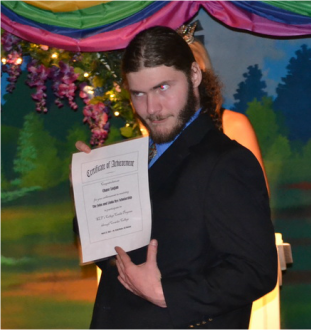 Chase Logan shows off the scholarship he was presented with during the Angel Awards. 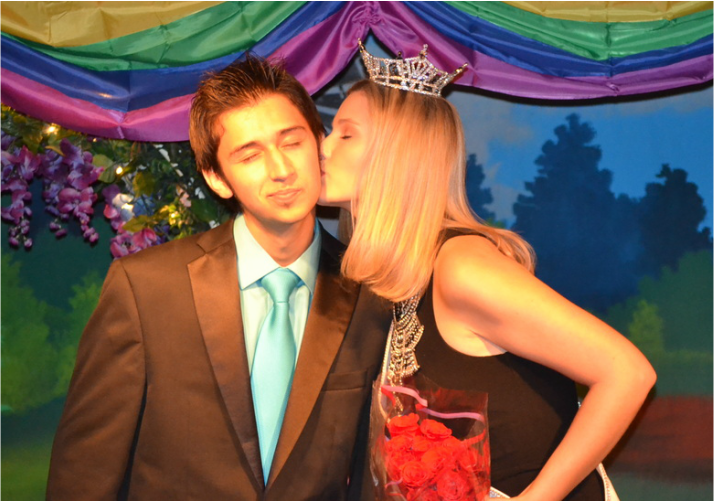 Alex Jimenez receives a kiss from Jessica Hartman, the current Miss Missouri, after he asked her to go to the prom with him. Hartman, who hosted the SLT Angel Awards, gave him the kiss for consolation after declining his invitation to go to the prom.